In order to get from Quetta (capital of Baluchistan, Pakistan) to the iranian border at Taftan, the traveller has two possibilities. The first one is the train. Twice a week a train (sometimes) manages to reach Taftan, 700 km away, in 30 hours. However, no-one in Quetta recommended this unreliable option. Most people chose the second possibility : the bus. Several big normal buses reach Taftan in 12 hours but there are no sleeper buses. There is basically nothing in between Quetta and Taftan so travelling in stages is out of question. With Kumiko, from Japan, we make sure to book tickets for front seats (less bumpy) on a decent bus with A/C (air-conditioning). Quetta is located at 1700 m high so it is not too awfully hot. But we know that it will be hot across the Baluchistan desert, at lower altitude and even at night. "Inch Allah, we will leave at 17.00". We leave at 17.30, not bad. A czech couple is travelling in the same bus. A little outside town, the bus stops on the roadside. More passengers ? 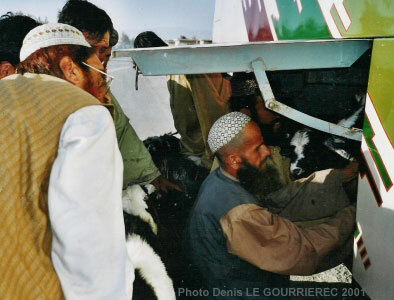 No, the bus is full and there is only a herd of goats outside.... Well precisely ... The goats are coming along ! They are squeezed in the luggage compartments  , four in each. No leg space for them, not much air either, surely some dust though. For us things are looking better. Our fellow travellers are friendly, talking a little, and it is not too hot thanks to the A/C. The bus is not too slow going and the indian music on board is quite acceptable. The road winds its way in a landscape of barren mud hills. We stop near a small mosque for the evening prayer at sunset. A few hours later, we stop again for dinner at a small roadside restaurant. Coming out of the bus is like entering an oven. Thank God (or Allah, as you wish  ) the A/C is working fine. When we leave, it's time to sleep and it turns out this is not going to be easy. Not only I find it difficult to sleep in sitting position but every vehicle coming in front blinds us with its powerful headlights, and forces our bus to slow down abruptly. The bumpy road is too narrow and both vehicles cannot pass without going onto the even bumpier hardshoulder. But the worse is ... it is getting cold. The A/C is too strong at night and we have to cover up. There seems to be a "on" and "off" but nothing in between. The driver opts for "off" and even opens the door. Less than half an hour is enough to reach the outside oven-like temperature. We bake until about 5 am when we finally reach Taftan. It is a small dusty village only existing for border purposes. One can find a tiny bazar of wooden huts with rusted tin roofs, a few custom buildings and some fences, and a small restaurants in mud-bricks. The owner courteously invites us to rest in a small room, behind a curtain until the border opens. I sleep like a log for 2 hours. Daylight had come already when we join our fellow bus travellers for some breakfast (rice, meat and chapati for them, bread, jam and milk for me). It is also possible to wash, and even to get a clean shave and a haircut before passing the border. I got one in Quetta, so I should be fine. We are also greeted by the usual money changers. "Sorry mates, we changed our Pakistan Rupees into Iranian Rials in Quetta, the rate was better". They joke a little with us when I try to change one chinese Fen for one Rupee. Not much business for them but they don't harrass us like their iranian colleagues at the turkish border, who were desperate sharks. At about 8am, we get the Pakistan exit stamp and we enter Iran through a small metal door. The guard asks me on a friendly tone "Where are you from ?". I say "France". He replies, smiling "ah Frantsa, good good, Zidane, football, good, welcome to Iran". Thanks mate. I don't like football but it doesn't matter. Most of this first day in Iran was spent in a bus (for a change...), because the first halt, Bam, is over 400 km from the border. We cross an flat barren immensity, an immensely boring desert. It's time to catch up on sleep, there is no beautiful landscape to be missed. At one stop, we meet another japanese girl who was less lucky with her bus from Quetta. It broke down and she preferred to get a lift on top of a truck rather than to wait with the other passengers. She made it anyway. There are always two drivers in Iranian buses and they change regularly, and one feels safer than in chinese buses. The fact that they change while driving is a little less reassuring. Police controls are frequent and drivers must show a disc where speed is recorded. Policemen are also on the look for hard drugs, smuggled from Afghanistan to Europe. Iranian buses are old Mercedes buses, still in a pretty decent state ("Beautiful Bus" is often written in big letters on a side window) but there is not A/C. Before leaving town, the bus stops outside a shop where the driver buys a huge chunk of ice. Broken up with a hammer, the ice keeps cool the tank of drinking water near the door. Then, during the trip, fresh water is offered regularly by the second driver to the passengers. In the evening we arrived in Bam. For 1000 Rials (about 0.15 USD or Euro)  a taxi took us all to Akbar Guesthouse. Akbar, a former english teacher, is a funny man. His guesthouse is a blessing for travellers and after over 1100 km in 24 hours in buses, the confort of his excellent guesthouse was well deserved.